This week I am taking a break from my Fort Worth criminal defense cases to attend a Continuing Legal Eduction at the Air Force Judge Advocate General’s School at Maxwell Air Force Base in Montgomery, Alabama. I am a reserve military judge in the Marine Corps and this is one of the annual training requirements for military judges. 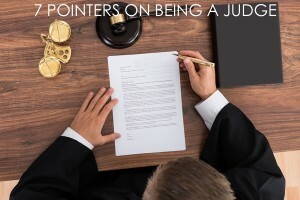 In one of our periods of instruction, the Chief Judge from the Court of Appeals for the Armed Forces (the highest court in the military justice system) gave us seven helpful tips on Being a Judge. I found them to be simple yet incredibly insightful. As you read these, you’ll notice that they not only apply to military judges, but state judges, prosecutors, and criminal defense lawyers as well. Simple, insightful, and easy to apply to our practice every day. We would all do well to observe these tips as often as possible. Practicing criminal defense in Fort Worth, I am fortunate to observe my colleagues, adversaries, and judges applying these pointers all the time. But sometimes there are cases or opposing counsel that tempt us to violate some of these rules (especially rules 1-3). I am thankful for the reminders and will continue to apply them to my practice both on the bench in the military and in the courtroom in Fort Worth.